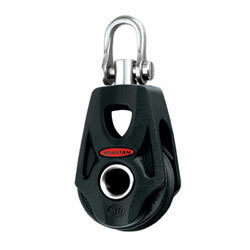 Ronstan Ball Bearing Orbit Blocks™boast the highest strength-to-weight ratio available. This is achieved through all-composite reinforced polymer materials and multiple attachment options. Their precision design provides the optimum number of ball bearings for minimum friction while weight reduction is achieved through the use of fiber-reinforced composites in the block head, cleat arms and beckets. Kilogram for kilogram of working load BB Orbit Blocks™ are the world’s lightest. To gain peak performance, Ronstan engineered out the heavy steel load straps, head post, shackle and cleating accessories. Through extensive research and development, Ronstan replaced virtually all metal components with high-tech polymers and fiber equivalents. The sheave and bearing system is supported by a fiber-reinforced load frame, computer modeled and optimized using advanced stress analysis methods. 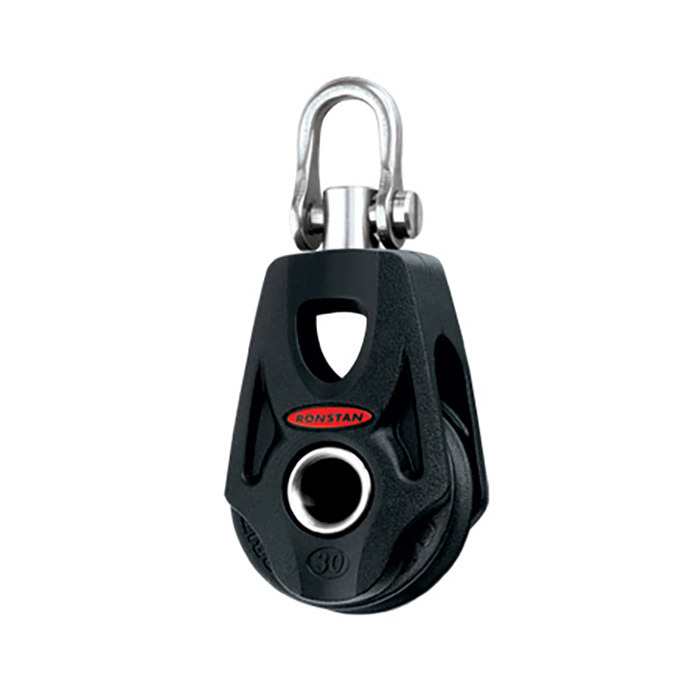 The Dyneema® Link, used in multi-sheave blocks, is produced from high spec SK75 fiber, which is 10 times stronger and lighter than steel, and provides the final connection from the block to the load point. Ronstan BB Orbit Blocks™ feature strong, lightweight fiber-reinforced cleat arms optimized at the required cleating angle. Race-proven, carbon-fiber reinforced Ronstan C-Cleats give secure rope holding with low entry and exit efforts, and are fitted with fairleads for fast action from any angle.